Who doesn’t love super heroes? I know we love ’em. One of our favorite movies last year was The Avengers. My husband, my son, and I loved the movie. I enjoyed the movie for a different reason than they did… Thor. That’s all I’m saying. My son loved pretending to be Superman, Spiderman, The Hulk, and Iron Man at different stages in his ten years of life. So he was thrilled when I got Marvel Avengers: Battle For Earth for the Wii U. His favorite character to play as in Marvel Avengers is Spiderman. I think this is because ol’ Spiderman was always his favorite Super Hero to begin with. He says Spiderman is the best character to play, though, in Battle for Earth. Who am I to argue? The object of the game is to defeat all the Skrull. You become one of your favorite superheroes to save the world. You can play with friends or against the AI. There are over 20 characters to play and not all of them are superheroes. My son actually liked playing as Venom, as well. <insert rolling eyes —->here). There are lots of power ups in the game, which my son loved. However, he said that he found the game to be just a bit boring. He says it was repetitious (his word)… not much variety from character to character. Because of this he gives it a 3.5-Star on a 5-Star scale. 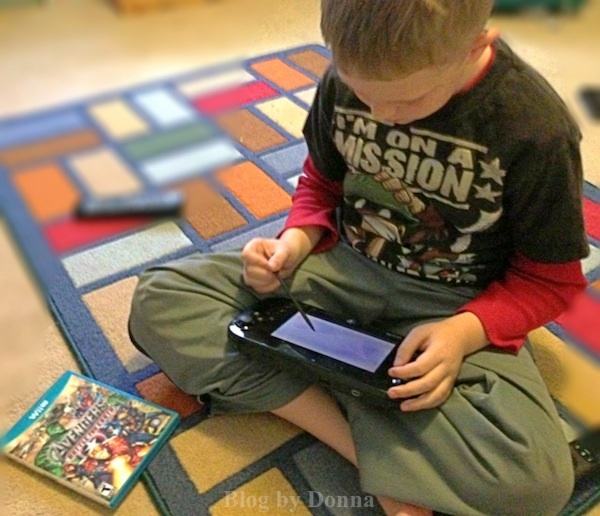 Note: He also says that the player using the Wii U tablet itself, is at an advantage. It is easier to use the stylus and tap faster then it is to use a controller to press the button. This game is rated T for Teen, and yes my son is not a teenager, yet, but we felt if it was okay for him to watch the “Superhero” movies, he could play the games. Besides, he doesn’t play them without supervision. And as I was telling my husband, he reads books that are on a high school level. In conclusion, my son says he thinks both boys and girls will like playing Marvel Avengers Battle For Earth, because who doesn’t want to save the world?!?! You can buy Marvel Avengers Battle for Earth on Amazon for $40.99. Disclosure: I received a copy of the game to facilitate my review. All opinions are my own. I only work with brands/companies/projects I love. How much fun is that!! This game looks especially fun and I bet my daughters would be into it just as much as my husband and son. The only game I ever loved was Tetris. I also love those matching/disappearing shape games. That’s neat that your son gets to help you with this review. I’m sure when my son gets a little older he is going to want to play games like this one. I’d better start saving my pennies. I don’t know a thing about these games and the tablet, but after reading your review it’s apparent it’s very popular among the younger kiddos. Thanks for participating in my very first Tuesday’s Thoughtful Comments hop, hope you come back next week. I spent many a day in Game Stores browsing for games for my nephew–or waiting with his parents while he disappeared for a long while! Then I got smart–I began purchasing gift cards for his fav game store!! So then instead of me having to be in the store–I was outside just waiting!! Kids really do like all these games. I beleive in some of them you can actually trade in the old games for a new one!! These can get expensive. Stopping by from Tuesday’s Thoughtful Comments Hop. I love superheroes. My favorite is none other than Superman and I named my son Kal-El in his honor. I have yet to see the Avengers because I haven’t seen Captain America yet but I will see it soon. I would love to get this for my 11 year old. I think he’d love it. I love reviews that my children can help me with. They always feel as though they are helping Mommy “work”. With that being said, this game looks like so much fun!!! The big kid in my would love to play this with my boys. It looks like something both my 11 year old and almost-5 year old could appreciate! My brother would love this! He doesn’t have a Wii U though. Maybe for Christmas.